A note from Dan Rather: I'm aware that my musings run counter to some of the more prominent early reviews in high-profile publications such as The New Yorker and the New York Times. But with all due respect (and I have a lot of it for those reviewers), I just don't think they "get it"; they've somehow missed the breadth, depth and "got it right" qualities –- and importance — of Newsroom. Maybe it's because they are print people. Then, too, maybe they're right and I'm wrong. I never rule out the possibility of that. But I've lived in the world of television newsrooms for most of my adult life. I know the people, the venues and the challenges — the satisfactions of success and the heartbreak when things go awry. From where I sit and based on my experience, Sorkin and crew have got it amazingly right, even when they over talk it. Any television program that has its main characters quoting Cervantes can't be all bad. And so it is with The Newsroom. Mark well, however, that with this HBO series premiere more praise is justified. A lot more. I've only seen the first program, but if what is to follow is as good as this first show then Aaron Sorkin has a winner. Sure, I've got my nits to pick with it; and, no, it's not perfect. But there's a lot to like in what Sorkin and his cast have done here. There is a newsroom authenticity to what's presented and much that gets to the heart of modern American journalism's problems. There is a battle for the soul of the craft that goes on daily now in virtually every newsroom in the country. It's a fight that matters, not just for journalists but for the country. It centers on whether news reporting is to be considered and practiced—to any significant degree, even a little—as a public service, in the public interest ,or is to exsist solely as just another money-making operation for owners of news outlets. 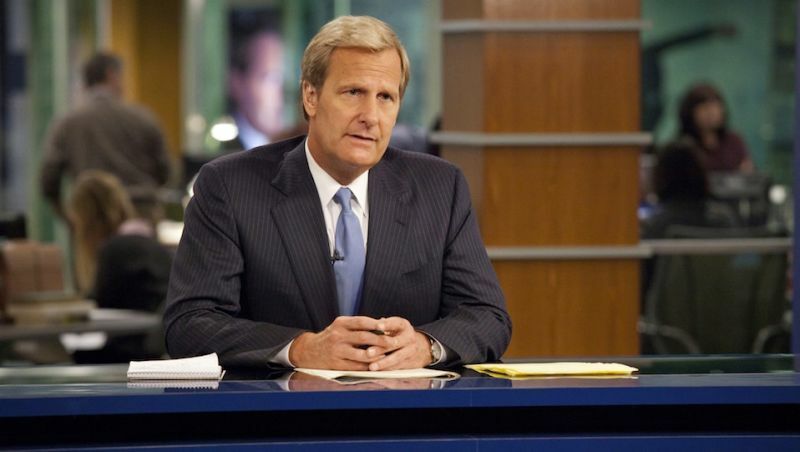 As the Newsroom character MacKenzie (Emily Mortimer) says, in challenging the anchorman Will McAvoy (Jeff Daniels) to be a crusader for quality journalism, "There is nothing more important in a democracy than a well-informed electorate. When there is no information or, much worse, wrong information, it can lead to calamitous decisions that clobber any attempts at vigorous debate." This is the battle being lost in almost every newsroom, in every place around the world. Ratings (or circulation), demographics, and profits rule. Any talk of the public interest or of doing quality journalism of integrity with guts is considered passé. The show gets close to the bone of what happens, what really happens, behind the scenes in newsrooms and the boardrooms that govern them. One small nit: What's going on in gathering news and getting it on the air all seems so seamless in the show. In the real world of television news, it isn't. I especially liked the emphasis on the necessity of having sources and doing real reporting (maybe not enough emphasis on this to satisfy me.) Also, the depiction of when to go with a story, when and what to lead with on a newscast is good. One thing missing, for me anyway, in this first installment is a deep enough sense that most newsrooms—television and otherwise—have a kind of "valley of broken dreams" feel to them... an echo in the interior of people who got into news because of their idealism, now struggling with the reality of compromises they're forced to make daily if not hourly. In the real world, the undertow of this is palpable but often goes unspoken. In Newsroom, it's spoken often. Yes, it's a bit too preachy here and there: show me, don't just have monologues and long pontifications about what the problems are. And no, on average newsroom people are seldom as smart or as high-minded as most of the lead characters in this fictional drama. But if you liked the movies Citizen Kane, Network, and Broadcast News, if you liked the television series West Wing, Mad Men, or The Good Wife, you're going to love Newsroom. At least the first installment. And if Sorkin, his writers and their excellent actors can maintain this level, you'll probably like the full run. It has the potential to become a classic. You can watch the entire first episode of The Newsroom on YouTube. Dan Rather is anchor and managing editor of Dan Rather Reports. You can follow him on Facebook and Twitter.